A new trailer for The Predator has arrived. Shane Black, writer of such movies as Lethal Weapon and Last Action Hero and director of movies like Iron Man 3 and The Nice Guys, has been hard at work trying to bring the classic franchise back to the big screen. This serves as both a sequel and a reboot, honoring what has come before but also carving its own path. Now, Fox has released a new red band trailer giving us a better look at what to expect from this new entry in the franchise. 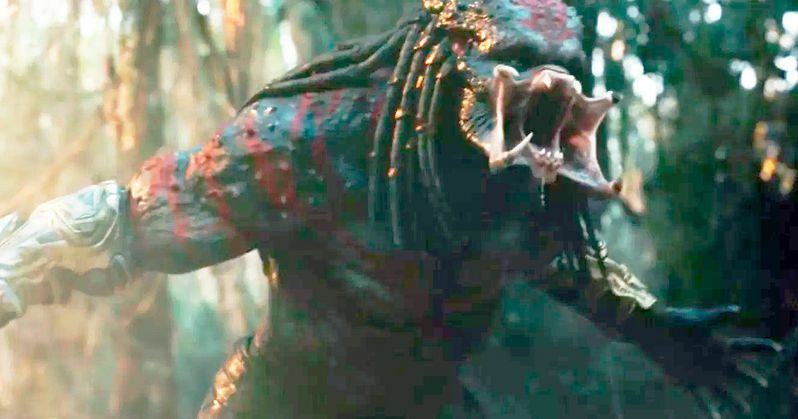 The previous trailer didn't do as much to get fans excited about The Predator as the studio may have liked. It appears as though this movie is going in some bold new directions and that has presented a bit of a marketing challenge for Fox. Challenging or not, this movie is set to arrive in theaters on September 14 following several delays. The legendary alien hunters are willing to wait no longer. They're out for blood and this time around, they're equipped with all kinds of special upgrades. The Predator brings the action to the small-town streets of suburbia where the hunt comes home in what is being billed as an "explosive reinvention of the Predator series". Now, the universe's most lethal hunters are stronger, smarter and deadlier than ever before, having genetically upgraded themselves with DNA from other species. That explains the mega-Predator we've got going on here. The creatures are summoned when a young boy accidentally triggers their return to Earth. It's up to a ragtag crew of ex-soldiers and a disgruntled science teacher to prevent the end of the human race at the hands of these upgraded killing machines. Shane Black directs from a script he co-wrote with Fred Decker. The pair previously collaborated on Monster Squad. The cast includes Boyd Holbrook, Yvonne Strahovski, Olivia Munn, Trevante Rhodes, Keegan-Michael Key, Sterling K. Brown, Jacob Tremblay, Thomas Jane, Alfie Allen, Augusto Aguilera, Jake Busey and Edward James Olmos. Arnold Schwarzenegger was originally offered a small role but reportedly turned it down. As for as we know, he's not going to be featured in the movie unless they managed to sneak him in somehow, but don't get your hopes up. Despite a lot of trying, no movie has really even come close to living up to the original Predator. 2010's Predators offered some good fun and gave it a solid shot, but this really has been a situation of lighting striking once and only once. Fox surely hopes that they can rejuvenate the franchise and get more than just one new movie out of the deal this time around. Fans would probably like this as well, assuming this new take on the franchise is one that warrants future expansion. Fingers crossed. Be sure to check out the new trailer for The Predator, courtesy of 20th Century Fox, for yourself below.